NAJA has developed our own version of the popular game BINGO! 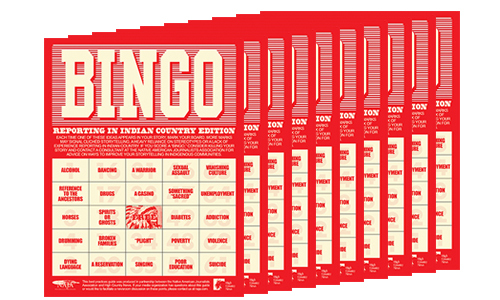 Reporters and editors can refer to this helpful BINGO card when writing or editing a story about Indigenous people or communities. If you "score" too many tropes or stereotypes and hit BINGO, you need to rethink your story. A fun game for any newsroom hoping to improve their accurate and ethical reporting. With the newsroom bundle of 10 cards, keep one for yourself, pass the rest to your colleagues!